Objective This systematic review and meta-analysis aim to evaluate the risk factors associated with postoperative opioid-induced respiratory depression (OIRD). Data sources PubMed-MEDLINE, MEDLINE in-process, EMBASE, Cochrane Central Register of Controlled Trials, Cochrane Database of Systematic Reviews, PubMed and Clinicaltrials.gov (January 1946 to November 2017). Eligibility criteria The inclusion criteria were: (1) adult patients 18 years or older who were administered opioids after surgery and developed postoperative OIRD (OIRD group); (2) all studies which reported both OIRD events and associated risk factors; (3) all studies with reported data for each risk factor on patients with no OIRD (control group) and (4) published articles in English language. Data analysis We used a random effects inverse variance analysis to evaluate the existing evidence of risk factors associated with OIRD. Newcastle-Ottawa scale scoring system was used to assess quality of study. Results Twelve observational studies were included from 8690 citations. The incidence of postoperative OIRD was 5.0 cases per 1000 anaesthetics administered (95% CI: 4.8 to 5.1; total patients: 841 424; OIRD: 4194). Eighty-five per cent of OIRD occurred within the first 24 hours postoperatively. Increased risk for OIRD was associated with pre-existing cardiac disease (OIRD vs control: 42.8% vs 29.6%; OR: 1.7; 95% CI: 1.2 to 2.5; I2: 0%; p<0.002), pulmonary disease (OIRD vs control: 17.8% vs 10.3%; OR: 2.2; 95% CI: 1.3 to 3.6; I2: 0%; p<0.001) and obstructive sleep apnoea (OIRD vs control: 17.9% vs 16.5%; OR: 1.4; 95% CI: 1.2 to 1.7; I2: 31%; p=0.0003). The morphine equivalent daily dose of the postoperative opioids was higher in the OIRD group than in the control; (24.7±14 mg vs 18.9±13.0 mg; mean difference: 2.8; 95% CI: 0.4 to 5.3; I2: 98%; p=0.02). There was no significant association between OIRD and age, gender, body mass index or American Society of Anesthesiologists physical status. Conclusion Patients with cardiac, respiratory disease and/or obstructive sleep apnoea were at increased risk for OIRD. Patients with postoperative OIRD received higher doses of morphine equivalent daily dose. This is the first meta-analysis to provide a comprehensive, up-to-date analysis of the available evidence on the risk factors associated with opioid-induced respiratory depression in in the postoperative period. This is the first meta-analysis which addresses ‘whom to monitor’ (cardiac, respiratory disease and/or obstructive sleep apnoea) and ‘when to monitor’ (up to 24 hours) for postoperative opioid-induced respiratory depression. This meta-analysis has limitations inherent to observational studies, as quality and completeness of medical records would have adversely influenced the results. There could be a publication bias, as we searched only articles in English language. Opioids are the cornerstone therapy for the management of moderate to severe postoperative pain, but they have numerous adverse effects, the most serious being opioid-induced respiratory depression (OIRD).1 Postoperative OIRD increases perioperative cost and hospital length of stay (LOS) and may result in permanent morbidity and mortality.2 The major cause of opioid-related death is OIRD, which leads to hypoxia and hypercapnia, further accentuating the vicious cycle, finally causing cardiorespiratory arrest. A better understanding of risk factors predisposing to OIRD could potentially lead to better prevention strategies. 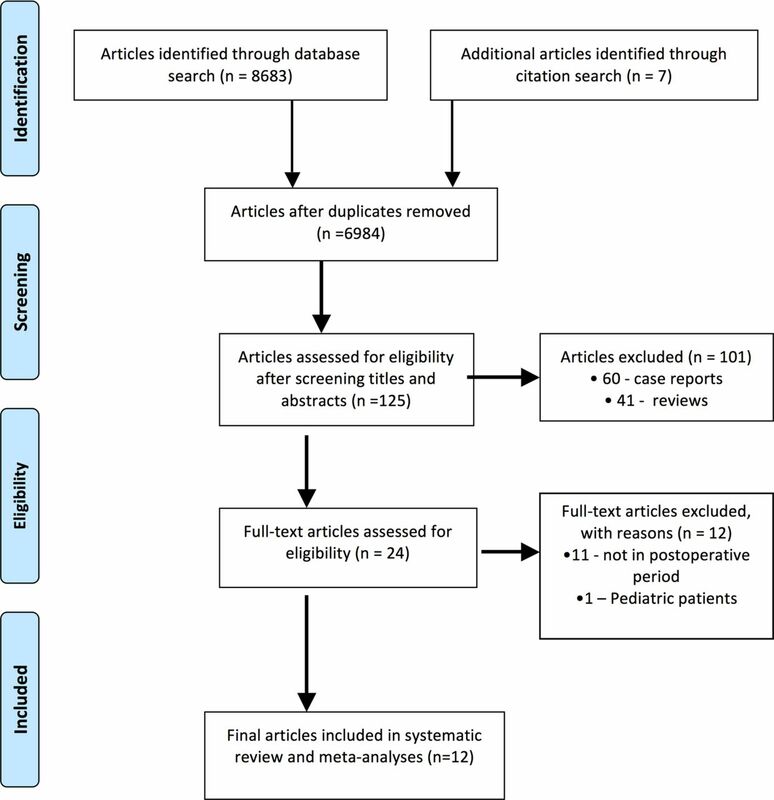 The primary objective of this systematic review and meta-analysis (SRMA) was to evaluate the published literature to identify the potential associations between patient and procedural characteristics and postoperative OIRD. Knowledge of risk factors of OIRD will enable the healthcare providers to take appropriate precautions, plan risk mitigation, titrate the dose of opioids and use enhanced monitoring in high-risk patients. This study is a SRMA and does not involve the patients and or public. The literature search was performed with the help of an expert research librarian familiar with the content area. The following databases were searched using the MeSH keywords according to the predesigned protocol (online supplementary file S1): PubMed-MEDLINE, MEDLINE in-process, EMBASE and EMBASE Classic, Cochrane Central Register of Controlled Trials, Cochrane Database of Systematic Reviews, PubMed and ClinicalTrials.Gov. Initial search was first conducted from January 1946 to November 2016. Full search strategy (including MeSH terms) is shown in online supplementary file S2. A repeat search was performed in November 2017 just before finalising our data for statistical analyses to find any new studies on OIRD. This systematic review included adult surgical patients (≥18 years), who were administered opioids during their hospital stay after surgery and had postoperative OIRD (OIRD group). We included observational studies that reported both OIRD events and risk factors that predicted or were associated with the occurrence of OIRD. Studies which reported data for each risk factor in the control group were included in the meta-analysis. Case reports, editorials and letters to journals were excluded. Only published articles in the English language were selected. For this SRMA, OIRD was defined by including the definitions of OIRD from all 12 studies,3–14 that is, naloxone administration for reversal of respiratory depression (respiratory rate <8/min and/or oxygen saturation <90% and/or apnoea ≥10 s), excessive sedation or upper airway obstruction. Studies were selected independently by two reviewers (KG, MN/AP), who first screened the titles and abstracts to determine whether the studies met the eligibility criteria. Full text copies of articles that were deemed to be potentially relevant were retrieved. Any disagreements were resolved by consulting the senior author (FC). Duplicate publications were excluded. A citation search by manual review of references from primary or review articles was also performed. Meta-analyses were performed to identify the potential risk factors for developing OIRD across demographics, medical comorbidities, types of surgery and anaesthesia and opioid-related characteristics. A risk factor was considered for meta-analysis if it was evaluated, and data were available in at least two studies. For dichotomous risk factors (eg, gender, comorbidities), OR comparing each risk factor with 95% CI, was calculated from the number of events in each group and total number in each group. For continuous risk factors (eg, age, BMI, MEDD and LOS), the weighted difference in means between groups was calculated from the mean and SD in each group. The inverse variance method was used to pool effect estimates for both dichotomous and continuous risk factors. The effect sizes were pooled using random effects models. For statistically significant risk factors, influential analysis was performed. The analysis was conducted using the Review Manager software (RevMan, V.5.3). P<0.05 was considered as statistically significant. Heterogeneity between studies was assessed using the I2 statistic. Heterogeneity was explored by excluding each of the studies and estimating the contribution of trials towards heterogeneity. A symmetrical inverted funnel plot was considered as the absence of publication bias. This was cross-checked by Egger’s regression test. Our initial search yielded 8690 citations (figure 1). After deduplication, 6984 records were screened by titles and abstracts, and 125 articles were extracted for full-text reviews. Twelve observational studies met the inclusion criteria for the systematic review.3–14 The systematic review of included studies is given in the tabular column in online supplementary file S3. The definitions of OIRD varied across studies (online supplementary file S4). These studies were comprised 841 424 surgical patients, out of which 4194 patients (0.5%) developed postoperative OIRD, with an incidence of 5.0 cases per 1000 anaesthetics delivered (95% CI: 4.83 to 5.14). Among postoperative OIRD events, 80% (3333/4194) occurred within first 12 hours and 85% (3567/4194) within first 24 hours (table 1). Mean age4–11 13 14 and BMI4 7–9 11 13 of patients with OIRD was 58±6 years and 28.8±3 kg/m2, respectively (table 1). The quality of studies was scored according to the Newcastle-Ottawa Scale scoring system. The study quality scores varied from 5 to 9 (online supplementary file S5 and S6). Flow diagram of search strategy used for systematic review and meta-analysis. Five studies provided data on OIRD and control groups for inclusion in the meta-analysis. These studies were assessed for potential associations between variable risk factors and postoperative OIRD.4 5 7 8 14 Figures 2 and 3 summarise the meta-analyses of potential risk factors categorised into demographic risk factors, medical comorbidities, types of surgical procedures, opioid-related risk factors and LOS. Meta-analysis evaluating the risk factors for respiratory events between OIRD and control groups in patients undergoing surgery. The pooled OR for each risk factor is plotted along with the 95% CI summarises the effect size using the inverse variance random effects model. Age and BMI represented as mean±SD. ASA, American Society of Anesthesiologists; BMI, body mass index; I2, heterogeneity; OIRD, opioid-induced respiratory depression; OSA, obstructive sleep apnoea. Meta-analysis evaluating the risk factors for respiratory events between OIRD and control groups in patients undergoing surgery. The pooled OR for each risk factor is plotted along with the 95% CI summarises the effect size using the inverse variance random effects model. I2, heterogeneity; LOS, length of hospital stay represented as mean±SD; MEDD, morphine equivalent daily dose; OIRD, opioid-induced respiratory depression; PCA, patient-controlled analgesia. In 3706 patients with postoperative OIRD, the prevalence of cardiac disease was 45%,5 8 11 DM 23%,8 11 14 respiratory disease 17%,5 8 11 14 OSA 18%4–8 11–14 and renal disease 17%,5 11 14 respectively (online supplementary file S7). Among patients with respiratory disease, 81% had chronic obstructive pulmonary disease.5 8 11 14 We revealed that patients with cardiac disease (OIRD vs control: 42.8% vs 29.6%; OR: 1.79; 95% CI: 1.2 to 2.5; I2: 0%; p<0.002)5 8 and pulmonary disease (OIRD vs control: 17.85% vs 10.36%; OR: 2.27; 95% CI: 1.3 to 3.6; I2: 0%; p<0.001)5 8 14 were associated with increased risk for postoperative OIRD (figure 2). Nine studies evaluated OSA as a risk factor for OIRD.4–8 11–14 Out of 3706 OIRD patients, 669 patients had OSA (18%). Due to lack of data in the control group, only five studies were combined in the meta-analysis.4 5 7 8 14 In these five studies4 5 7 8 14 involving 13 847 patients, three studies provided data on multivariate adjusted OR4 7 8 and two studies on univariate unadjusted OR.5 14 OSA was found to be significantly associated with OIRD (OR: 1.4; 95% CI: 1.2 to 1.7; I2: 31%; p=0.0003) (figure 2). Our analysis showed that one study contributed the maximum heterogeneity.8 When recalculated with exclusion of this study, pooled estimate was slightly decreased without affecting the final inference of our results (OR: 1.3; 95% CI: 1.16 to 1.48; I2: 0%; p<0.0001). The symmetrical funnel plot and egger’s regression test confirmed the absence of the publication bias. The type of surgical procedures were general and transplant (29%),3–6 8 14 orthopaedic (84%),3–8 14 thoracic and vascular (19%),3–5 8 14 uro-gynaecological (15%),3–5 8 14 neurosurgeries (5%)3 4 8 14 and head and neck surgeries (5%)3–6 14 (online supplementary file S8). Seven studies reported on surgical procedures involving 3617 patients with OIRD,3–8 14 with 3039 (84%) being orthopaedic surgery. No differences in surgical categories were detected between OIRD and control group (figure 2). Four studies reported data on dosage of opioids in OIRD and control group.4 7 8 14 The MEDD of postoperative opioids was higher in OIRD than control (OIRD vs control: 24.7±14 mg and 18.9±13.0 mg; mean difference: 2.8; 95% CI: 0.4 to 5.3; I2: 98%; p=0.02) (figure 3). In six studies, 57% (231/402) of patients with OIRD received PCA.3 5 6 10 12 14 Nearly 40% of OIRD patients had background continuous infusion of intravenous opioids in addition to PCA.5 6 10 12 In four studies, 18.8% (60/318) of patients with OIRD received epidural opioids.3 5 10 14 Five studies involved 329 patients with OIRD, where nearly 32% received the analgesia either by oral or intravenous route.3 5 6 10 14 Approximately 56% (399/703) of patients with OIRD received concomitant sedation in addition to opioids4 6 8 10 14 (online supplementary file S9). Only two studies provided data on anaesthesia type as a risk factor for OIRD.4 8 No significant difference in the incidence of OIRD existed between general anaesthesia and general anaesthesia supplemented by neuraxial analgesia. Three studies provided data on LOS involving 531 patients in OIRD and 944 patients in control.4 5 14 The mean difference in LOS was 1.26 days longer in OIRD versus control without any statistical significance (OIRD vs control: 8.84±2.75 vs 7.79±2.31 days; MD: 1.26; 95% CI: −0.06 to 2.58; p<0.06) (figure 3). To date, this is the first SRMA which evaluated the risk factors associated with OIRD in surgical patients. The incidence of postoperative OIRD in our study population was 5.0 cases per 1000 anaesthetics delivered, where 85% of cases occurred within the first 24 hours. We identified three patient risk factors: coexisting cardiac disease (1.79-fold), pulmonary disease (2.27-fold) and OSA (1.49-fold) that were associated with an increased risk for postoperative OIRD. Patients with OIRD received 23% higher MEDD than controls. There was an increased risk of postoperative OIRD in patients who had an underlying cardiac or pulmonary disease. Although the presence of underlying chronic disease is associated with a higher rate of postoperative complications,4 8 11 14 18 the potential mechanisms for these associations are not clear. These diseases could be markers of overall poor health and diminished cardiorespiratory functional reserve, resulting in a decreased ability to tolerate postoperative opioid analgesics. Alternatively, these diseases themselves may increase patient sensitivity to opioids, thereby increasing the risk for complications. 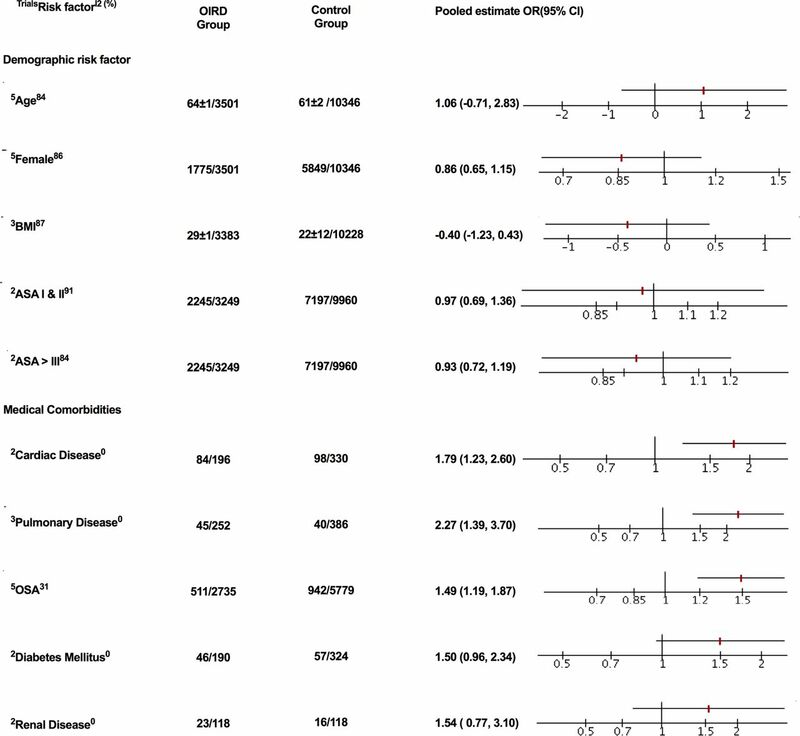 Recently, Ramachandran et al reported that the presence of cardiac or respiratory disease was independently associated with increased risk of postoperative respiratory complications.19 Weingarten et al reported that 34% patients with postoperative OIRD had pre-existing cardiac disease and 25% had pre-existing pulmonary disease.8 In a US health plan claims database, the presence of cardiopulmonary diseases is included in the screening risk index for serious prescription OIRD or overdose.20 We need to develop a screening risk index to quantify the risk of postoperative OIRD. Subramani et al reported that some surgical patients with death or near-death events received a low opioid dose of MEDD <10 mg/day.28 Further analysis of the dosage of intravenous opioids found a clear dose–response pattern with increased odds of death/near-death with increasing dose of opioids (ORs of 1.0, 1.5 and 3.0 at opioid doses of <10 mg, 10–25 mg and >25 mg; p for trend <0.005).28 Chung et al reported that 72 hours total opioid dose is a predictive factor for postoperative sleep-disordered breathing.29 A significant increase in central sleep apnoea occurred in patients on high doses of opioids (MEDD >200 mg/day) for chronic pain.26 With higher doses of opioids, the increase in sleep-disordered breathing can be an important contributor to OIRD. In a retrospective analysis of inpatient discharges, Overdyk et al reported a 3.5-fold increased risk of cardiopulmonary arrest in patients who were administered sedatives together with opioids compared with only a 1.8 times increased risk with either sedatives or opioids alone.34 In a study of veterans who died due to opioid overdose, coadministration of benzodiazepines and opioids increased the risk of mortality fourfold.35 Concomitant administration of sedatives and opioids is an avoidable risk factor. In a multimodal analgesic regimen, decreasing the dose of opioids when gabapentins is administered may minimise the risk of OIRD.32 Education of healthcare providers and patients regarding the risk of opioids and sedatives is the key to decrease risk of OIRD. Our meta-analysis showed that the majority of OIRD is reported within the first 12 hours and 24 hours accounting for 80% and 85% OIRD, respectively. Similar to our results, 88% of insurance claims were related to postoperative OIRD within 24 hours.10 Two other studies highlighted that around 60% of postoperative critical respiratory events occurred within 12 hours postoperatively.5 The highest risk period for OIRD is the first 6-hour postsurgical period4 7 8 with 34% of the critical respiratory events.11 This is probably due to a combination of the residual effects of anaesthetic medications. It has been suggested that prolonging the Post Anesthesia Care Unit (PACU) stay in patients with high-risk of OIRD may decrease the incidence of critical respiratory events, as a result of more intensive monitoring and earlier intervention.36 Enhanced monitoring during this period in the vulnerable patients will mitigate OIRD.29 37 38 The sample size and number of studies included in each of these risk factors varied as the authors of the various studies did not examine the same risk factors to evaluate the postoperative OIRD. Some of the studies in this review found a significant association between postoperative OIRD and age >50 years,5 12BMI4 and ASA 3 or 4,4 but the pooled estimate did not find any significant association with age, gender, BMI or ASA physical status. In the postoperative period, enhanced monitoring of levels of sedation and ventilation (respiratory rate (RR), pulse oximetry and capnography) especially in patients with high-risk of OIRD such as cardiopulmonary diseases, and OSA will enable us to detect OIRD and intervene earlier.39 40 Although the majority of studies in this SRMA were conducted in USA, the results are quite generalisable, as these studies are conducted from different institutions involving different population at different time period. This meta-analysis has the limitations inherent to observational studies, as the quality and completeness of medical and nursing records would have adversely influenced the study results. Naloxone administration was used to measure OIRD in 75% of studies.4 5 8–11 13 14 As mild cases of OIRD may not be reported, the true incidence of OIRD would have been underestimated, leading to a measurement bias. Typically, OIRD is defined using two classes of criteria: (1) ‘threshold criteria’, where OIRD is a deviation of RR, pulse oxymetry value or arterial carbon dioxide tension from an arbitrary threshold and (2) ‘rescue criteria’ using indirect evidence of OIRD, such as the use of an opioid or sedative reversal drug, positive pressure ventilation or a documented respiratory arrest. Such ‘rescue criteria’ interventions are sensitive, but non-specific markers for OIRD, and occur less frequently than events meeting threshold criteria. Naloxone administration is the only treatment currently available to reverse OIRD, and all our studies included in the meta-analysis used the naloxone as the rescue criteria. In addition to these limitations, some of the risk factors evaluated in our study had the high heterogeneity. 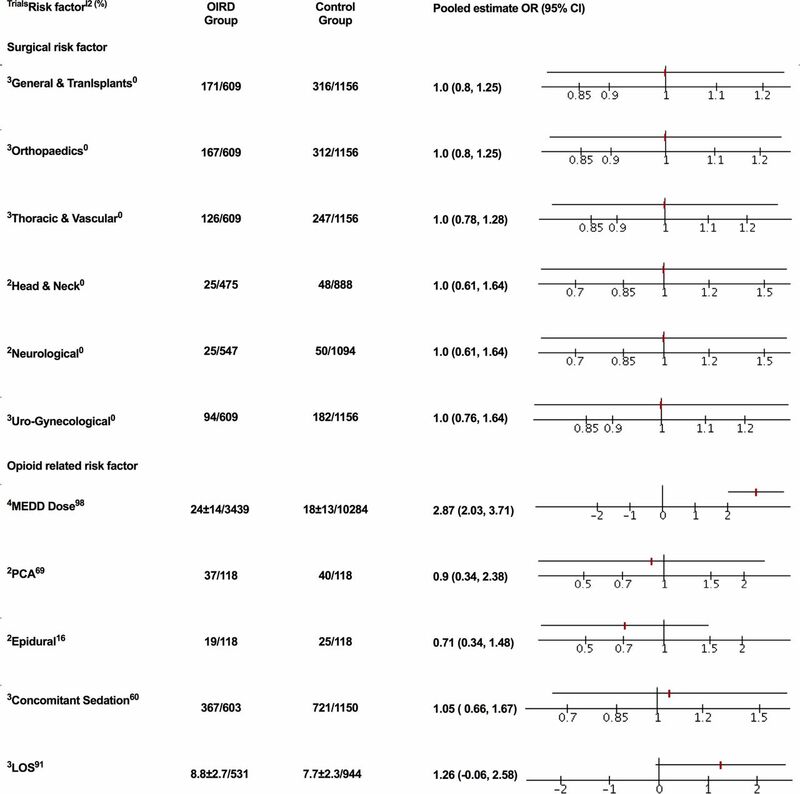 However, the thresholds for the interpretation of I2 can be misleading, since the importance of inconsistency depends on several factors.41 In our meta-analysis, heterogeneity was expected as the studies had the considerable variation as they were conducted at different time periods, in different population and different centres. Further, the lack of uniformity in the data prevented us to perform the meta-regression analysis and explore the heterogeneity. Finally, publication bias cannot be ruled out as our inclusion criteria included only the articles published in English language. In conclusion, the incidence of postoperative OIRD was 0.5% and 85% which occurred within the first 24 hours. Increased risk for OIRD was associated with pre-existing cardiac disease, pulmonary disease and OSA. The administration of higher doses of opioids is associated with an elevated risk of OIRD. These findings should be used to develop strategies for enhanced monitoring of high-risk surgical patients requiring opioid analgesia to prevent OIRD. The authors thank Marina Englesakis, Information Specialist, Surgical Divisions, Neuroscience & Medical Education, Health Sciences Library, University Health Network, Toronto, Ontario, Canada, for her assistance with the literature search.
. Incidence and demographics of post-operative naloxone administration: a 13-year experience at a major tertiary teaching institution. Pain Physician 2015;18:E827–9.
. The Newcastle-Ottawa Scale (NOS) for assessing the quality if nonrandomized studies in meta-analyses Ottawa. 2014 http//www.ohri.ca/programs/clinical_epidemiology/oxford.asp.
. Postoperative analgesia and respiratory events in patients with symptoms of obstructive sleep apnoea. Anaesth Intensive Care 2009;37:720–5. Contributors KG, MN, FC: designed the study, conducted the study, analysed the data and wrote the manuscript. AP: helped to design the study and wrote the manuscript. LA, TNW: helped with interpretation of data and manuscript writing. JW: helped with manuscript writing. Competing interests JW reports grants from the Ontario Ministry of Health and Long-Term Care, Anesthesia Patient Safety Foundation and Acacia Pharma outside of the submitted work. FC reports research support from the Ontario Ministry of Health and Long-Term Care, University Health Network Foundation, Acacia Pharma, Medtronic grants to institution outside of the submitted work, up-to-date royalties, STOP-Bang proprietary to University Health Network. TNW currently serves as a consultant to Medtronic in the role as chairman of the Clinical Endpoint Committee for the Prodigy Trial; has received unrestricted investigator-initiated grants from Merck (active) and Baxter (completed), and research support from Respiratory Motion (study equipment) and research support from Respiratory Motion (study equipment).